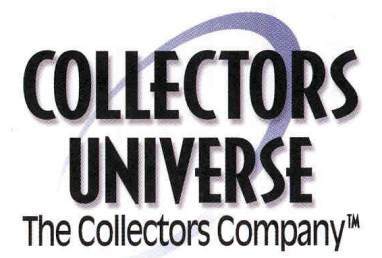 Home > Entertainment, Hotels, Motion Pictures and Sports > Motion Pictures and Other Entertainment > Collectors Universe, Inc. Beautifully engraved certificate from the Collectors Universe, Inc. This historic document was printed by the Security-Columbian United States Banknote Company and has an ornate border around it with a vignette of the company logo. This item has the printed signatures of the Company’s Chairman and Secretary. 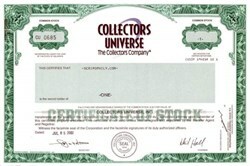 Collectors Universe, Inc. is the leading provider of products and essential services to the high-end collectibles market. The Collectors Universe brands, including Professional Sports Authenticator (PSA) are among the strongest and best known in their respective markets. The company grades and authenticates collectible coins, sportscards, stamps, and autographs. The company engages in collectibles commerce, selling coins, currency, sportscards and sports memorabilia, and entertainment memorabilia through direct sales, auctions, catalogs, and the Internet. The company also compiles and publishes authoritative information about collectible sportscards and sports memorabilia, United States and world coins, and entertainment memorabilia.